9 reasons to choose nebula. 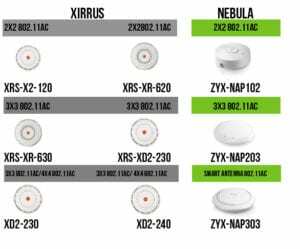 All nebula access points are standard, free of extra charge, covered with limited (= still 5 years after EOL announcement) lifetime warranty. During this period, in case of hardware failure, the NBD (next business day) a replacement unit will be shipped. If a faster replacement is needed, you can subscribe for the NBDD service (Next Business Day Delivery) for a minimal fee up to 4 years. In such scenario, a replacement unit will be delivered the next business day. This is the central management cloud management platform. No idea what it looks like? CHECK THE DEMO ! Stay in touch with the deltalink team and keep the advantage of working with your trusted advisor for all pre and after sales support. Why stop with cloud management at WiFi networks? With nebula you can also manage your nebula network switches and firewalls with the same intuitive platform! Want physical proof? Just ask a presentation, demo or test it yourself. To do so just contact deltalink. 9. Is your story the next success story? Dutch Hotel Chain, Bastion, meets customer’s wireless needs with ZyXEL Solution. For more info check the video below or DOWNLOAD THE PDF !